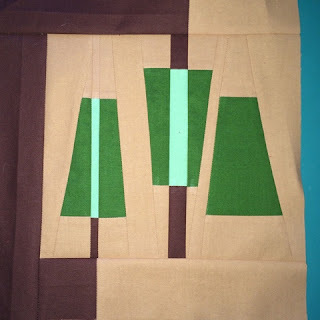 Usually I browse through my recent makes, look back at old blog posts to share again a special quilt for Blogger's Quilt Festival at Amy's Creative Side. 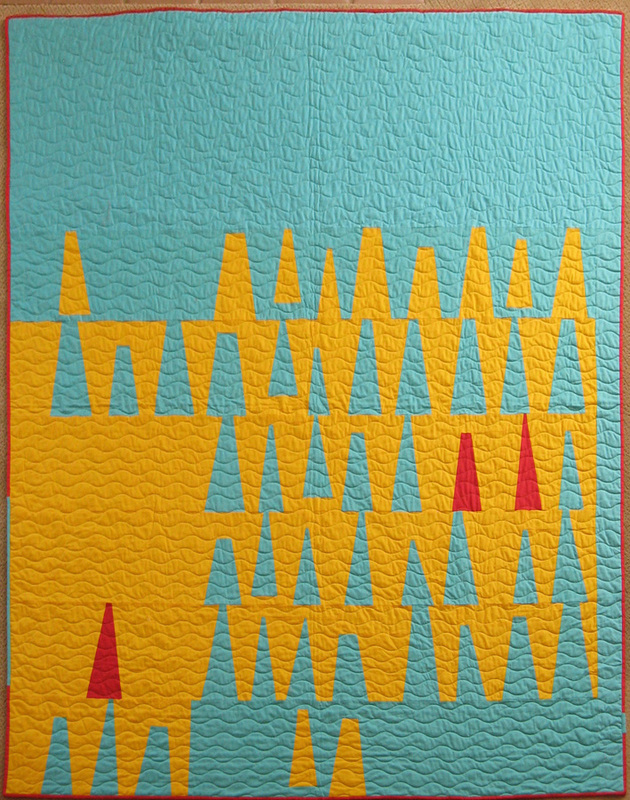 My first entry in the Small Quilt category, "Perspective" is exactly that. My second entry "Castles in the Sand" has not been blogged about here. 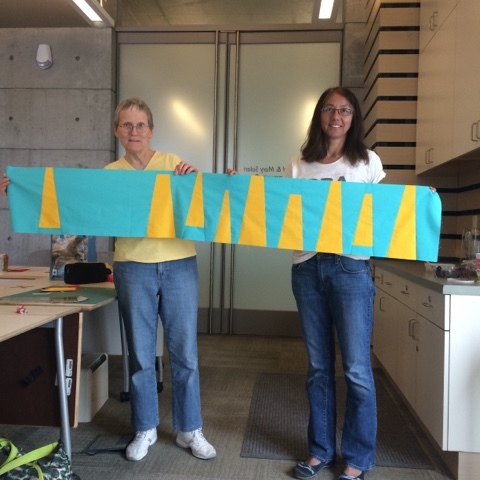 It's a collaborative Charity Quilt that came to being this summer. Since the festival's category of ORIGINAL DESIGN emphasizes the design aspect, I thought why not link up. 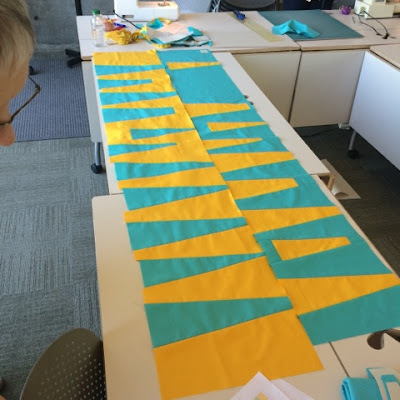 I was flattered when the chairty committee for our local MQG chapter unanimously chose my design mock up at our second planning meeting after brainstorming, sharing sources of inspiration and sewing up prototypes. You can read this post written by our secretary Renee on our South Bay Area MQG website. Castles In the Sand has been gifted to a wonderful local organization, Caroline's Non-Profit Thrift Shop. It is my understanding that they will do an online auction or raffle for it so I'll keep you posted. Minimalism does not come easily to me. Maybe that's what makes this experience stand out. 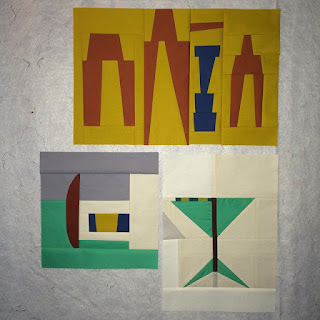 It was also about seeing a vision through to reality and the logistics of sewing from a sketch. I drew it using Inkscape easily enough but then it became "how do we do that?" Questions that were answered hands on one step at a time. There is no better feeling than when creative juices flow. We all get stuck and loose our mojo or putter along with projects we've started just because. But when things click and fall into place like it was meant to be, well that's the sweet spot to hold onto. Because the look was so graphic, placement and shape of the wedges was especially important. The construction of how to achieve the design of the quilt was improvised. I especially appreciate this quote from Cheryl Arkison "A sketch might not sound like improv, but it provides the intent and a guide". 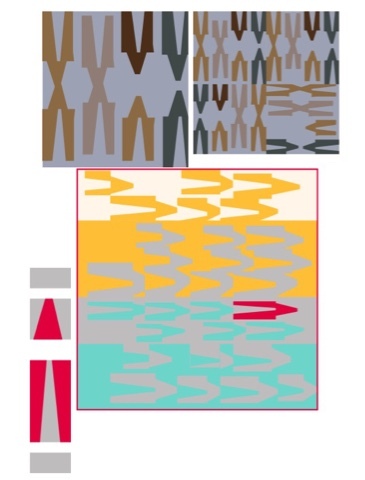 With every little shift to the left or right, thin or thick, tall or short the overall look was impacted drastically. It became a build as you go technique and was all about the parts and how they related to those around them. The point here was not to replicate it exactly, but to capture the essence of the image. Deciding which elements mattered the most was a moving target. Nothing minimal about the chaos of my house and our workspace in the living room but we made do. 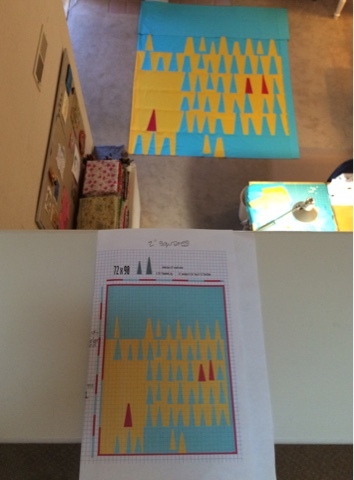 My multitude of ruler options were however quite useful. It was a marathon, back-to-back-to-back creation for Pam and I starting Friday June 26th at SewDay, my house on Saturday and then finishing up at hers on Sunday. 3 days and boom, it was a top! Not sure if either of us at or slept but I do know we both had a great time and created a wonderful gift of Charity. Original Design by: Me - the festival category !! Viewer's Choice nominations are closing soon so head on over NOW (CLOSED). You just copy the link of the top 3 quilt images you like and paste it into the box. Maybe mine will be one them, hint hint !!! EDIT: How exciting to be in the top 20 Viewer's Choice category, even though I didn't win it was a true honor. 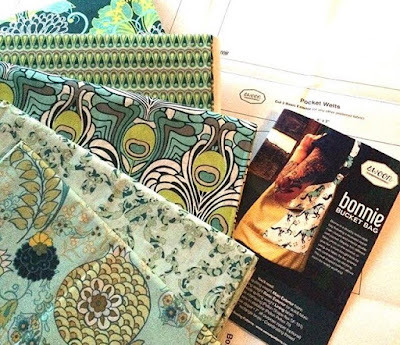 As a member of BeeSewcial, I have the opportunity to constantly explore. It's funny how my "failed" block humerously dubbed "Popsicle/Christmas Tree/Hangman" was what sparked the "successful" design. Proof of why we keep going and pushing. We can't anticipate where our ideas will lead and sometimes they lead to very special times and memories. Here are a couple of additional concepts having to do with merging and/or floating wedges. When I saw Pam Rocco's quilts at Pacific International Quilt Festival in Santa Clara, it was pivotal moment in my quilting journey. At the time I had no idea who she was, that she lived in my hometown, or that years later we would work side by side. 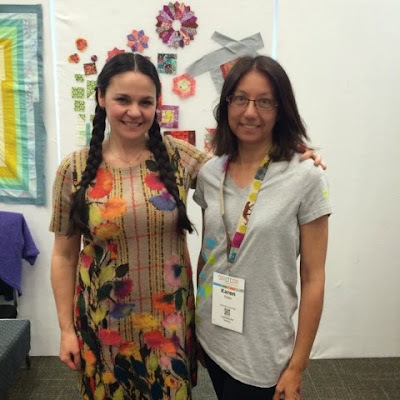 I confessed about being a total fangirl with Anna Maria Horner in my last post. 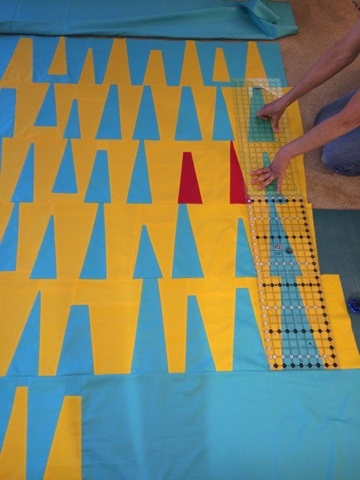 However, if I were to write down a list of quilters I admire, at the very tip top would be Pam Rocco (no offense AMH). It was a wow moment that I get to experience on a monthly basis during our guild's Show and Tell. I didn't send that other block to Debbie for Mod Mood but I did mail these three. 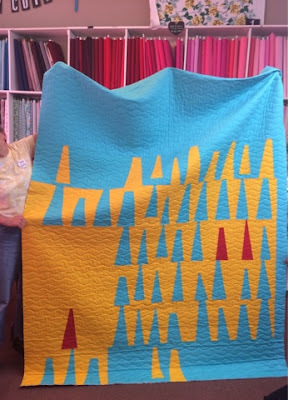 You can see her finished quilt in the Modern Category for the festival. Be sure to check it out and all of the other entries. I chose "Perspective" for the Small Quilt Category measuring 48"x60". You can nominate it for viewer's choice - open until Oct 29 here, I'd sure appreciate that! 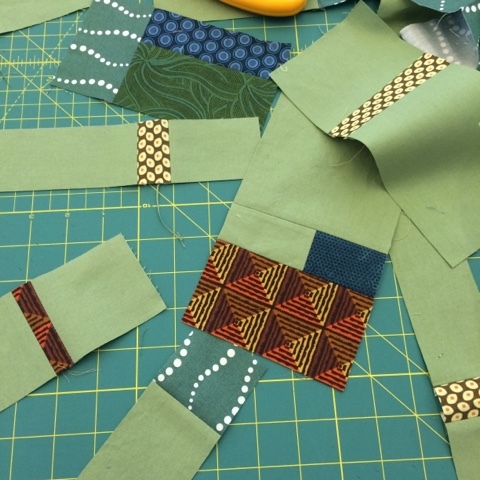 The fussy cutting and fussy quilting was well worth the extra effort and honestly what made it more fun to make. Stripes can be tricky and rewarding when used strategically. 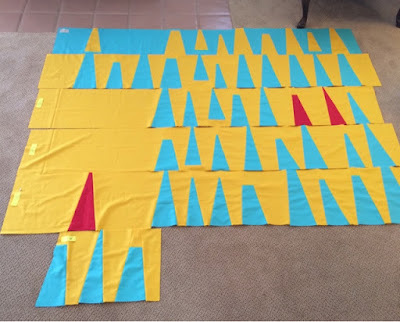 I had to laugh at myself for titling the blog post "Loominous - slow progress" considering the entire quilt took 10 days start to finish. 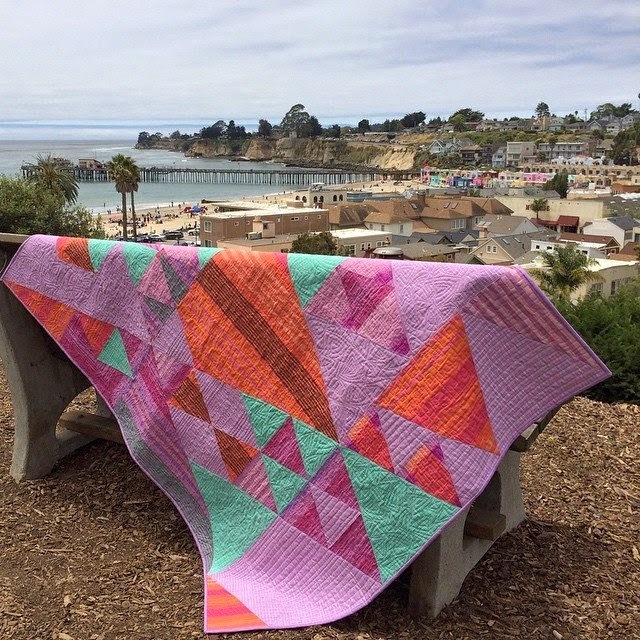 The renaming of the quilt to Perspective had to do party with the vista view looking down on Capitola Village but also applies to the way we view time - task - life. You can read more backstory here and here. 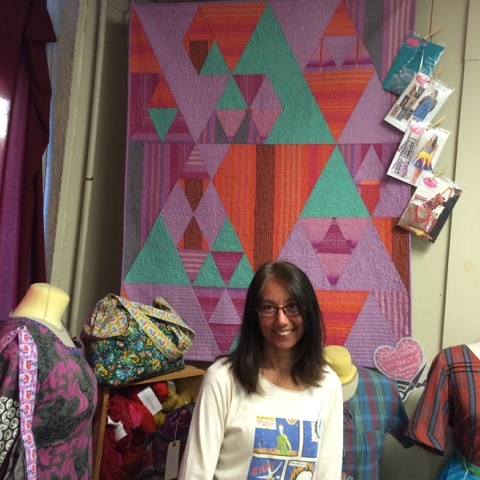 Having my quilt hang at the store display was really nice - and since our MQG chapter holds their monthly meetings at Hart's, I just had to point to it for show and tell. Scraps. Oh how I do love my scraps. That part is easy. Leaving negative space alone, well let's just say I am working on it. Earlier this month, I was fortunate to have attended a workshop led by our very own Tina ( little blue cottage), the talented founder of our local MQG chapter. 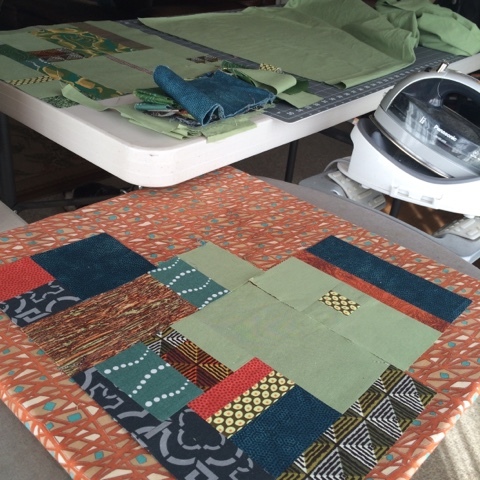 This is my center of the Much Ado About Nothing quilt. 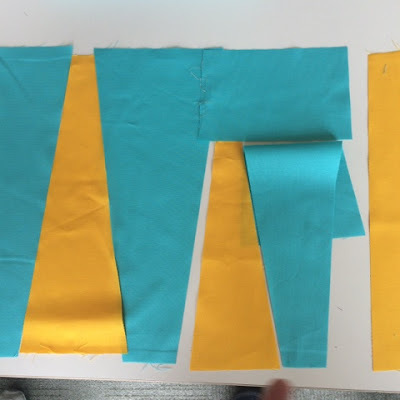 Those little bits are not in the pattern although Tina teaches it as an approach or guideline subject to personal twists so in that sense it's not breaking any "rules". When I got home, I kept at it. The quilt is for a wedding in January and I wanted it to be a Couple-size Throw rather than a bed quilt. With that in mind, I opted to reshape the parts into rectangles rather than leave them as squares. Sixteen large blocks and I will be done. It will be very different from Tina's (check it out here) Overall, I believe the minimalistic design of the quilt will still be felt despite my kitchen sink attack. We will see. 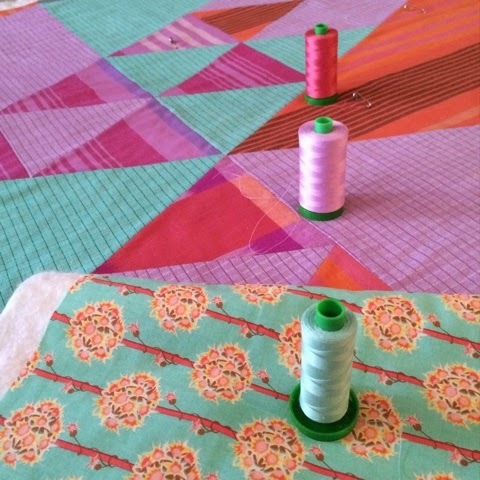 Linking up to Scraptastic Tuesday for October with Leanne at She Can Quilt. 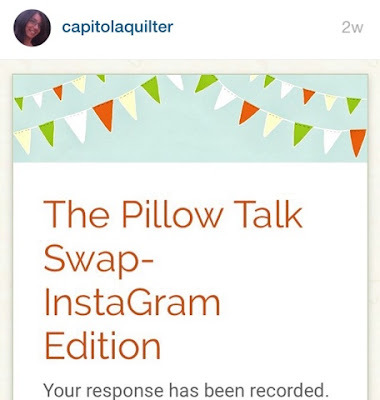 I'm honored to have had my x-plus quilt post chosen by Sara Lawson's Scrappy Quilt category on IG for the #SewcialChallenge. The projects are so much fun to check out and I've found a lot of new people to follow. 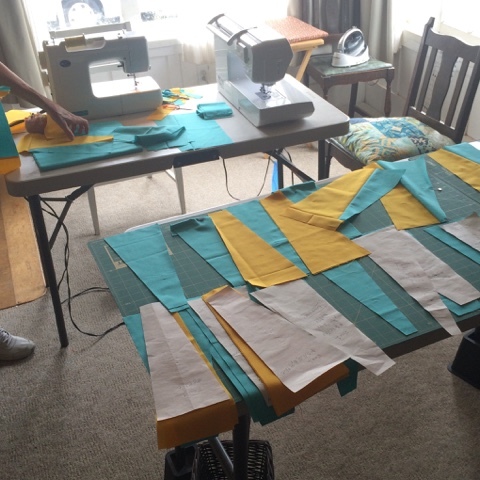 She's currently doing a Purse Palooza on her blog that is a wonderful resource, reviews, tips and a linky party too. 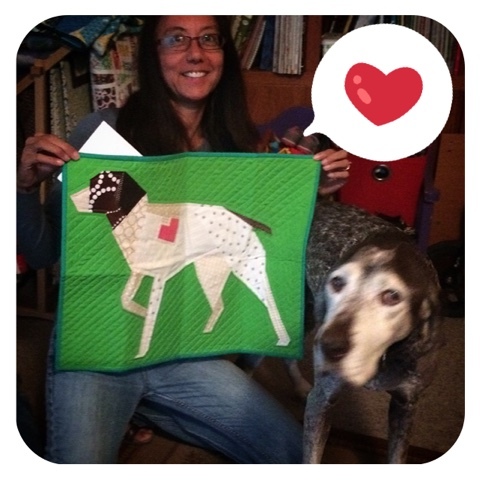 This beautiful quilt in loving memory of Dottie arrived unexpectedly in the mail yesterday from Anne Sullivan - well I say unexpected because it was a surprise but anyone who knows her also knows that such an act of kindness is no surprise at all. Read all about the back story and details of how she created this original design with her mad skills on todays Play Crafts post. I immediately handed my phone to hubby and said "here take a picture of us" - so although it looks as though Chase is photo bombing this is actually his attempt to pose. There are a few folds from shipping which I will press out before hanging it proudly. 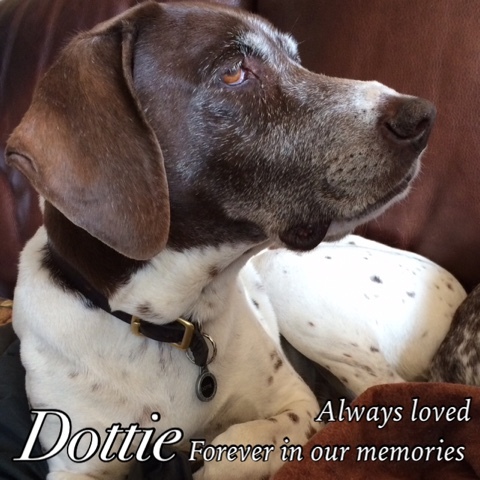 It's been two weeks since we said good bye and we are all adjusting slowing to life without her. Even though she was 14, she acted like she was two. 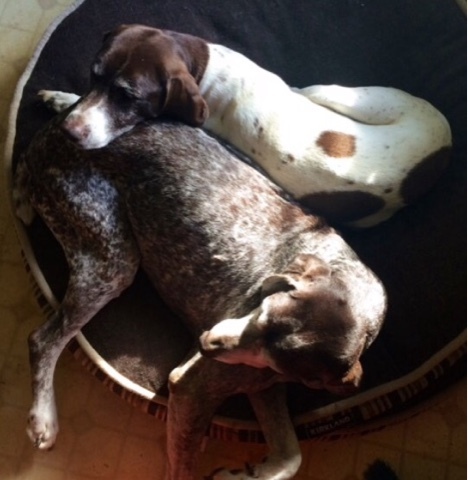 Chase continues to struggle with being alone - here's a photo of them together - they were very different personalities but soulmates for nearly their entire lives. 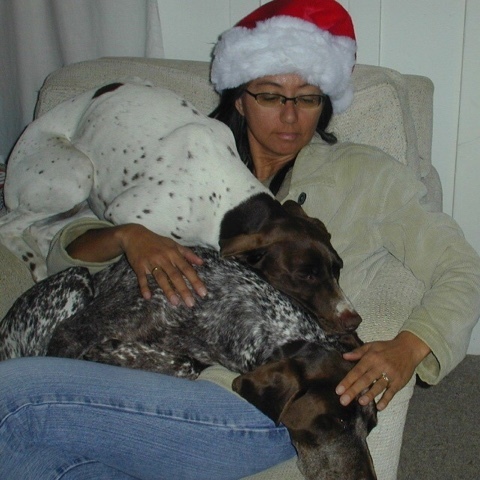 This is another favorite picture - Dottie was not a shy snuggler and could not get close enough her her humans. Being surrounded by guys, she and I stuck together and I called her my Dot-ter (pronounced daughter). You can tell it's an old photo because none of us were grey! If you are going to QuiltCon West 2016 in Pasadena, Anne will be one of the lecturers! I've signed up for her newsletters because as much as I'd like to keep up on my blog reading it's tough to fit it all in - this way I won't miss a beat. I should be packing the car to head out to our Retreat this morning but I just had to stop what I'm doing and share a quick post. 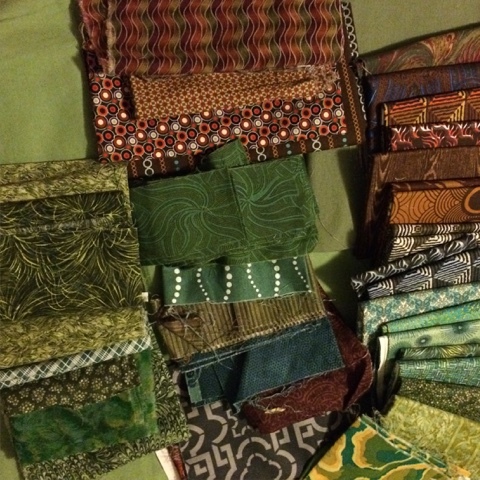 Proof positive that Quilty Friends are truly the best - not there was ever a doubt. Last quarter I missed the linky party deadline and am determined to make some of these goals a reality. Honestly, I don't expect to finish them all. 1. Greek Plus Puss Quilt. 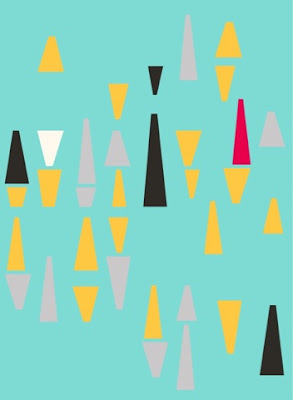 I love this one and it made an appearance in Q3 of 2014 on the to finish list - how sad it that?! 2. AMH Prism-along Quilt. 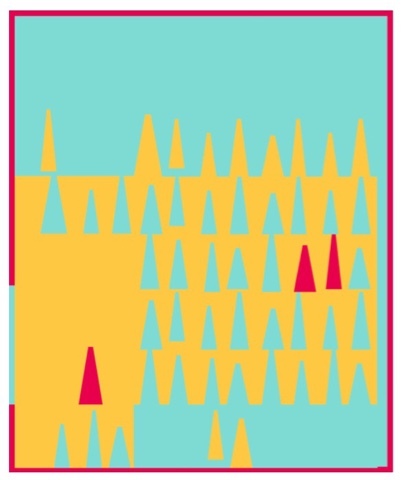 This one goes way back and I've got all or most of the triangles cut. I was reminded how awesome the project is when Tina shared hers in the display at Harts. 3. Giant Clams. After the workshop with Latifa last September I whipped this massive top together and even took it on a photo shoot. Hasn't been touched since and the plan was to have been sleeping under it all summer long. 4. Jacquie Gering Workshop Quilt. This one too has been trapped in a bag for way too long. I'm ready to tackle the negative space alternative grid layout now that I'm a little more experienced with the concepts she taught. 5. AMH QuiltCon Class. These flower parts from the workshop and so promising I had to include them in my goals. 6. Belated B'day. OK. For the record - this goal is my #1 priority. 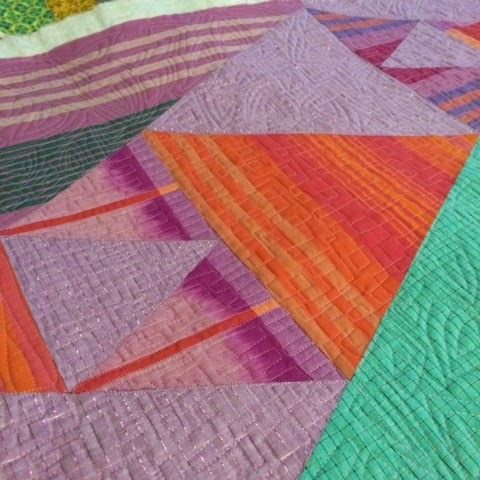 Delectable Mountain 21st Birthday quilt for my son who has not been 21 for a couple of years. 7. BeeSewcial Reflection Quilt. All of my blocks have arrived although they aren't all shown here. I'm taking this with me to the retreat tomorrow so I can at least see them on a big design wall and mull over the puzzle before me. It may take more brain power than the sleep-eat-quilt-retreat routine to actually do something worthy with them. 8. 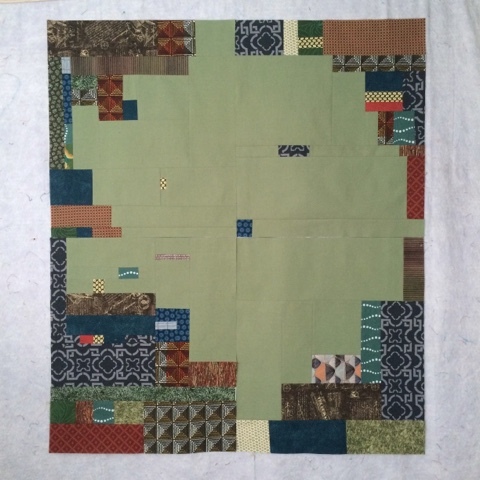 Much Ado Quilt. Although this is the newest WIP it has a good shot at being finished because I've got a deadline to give it as a wedding gift. There you have it. 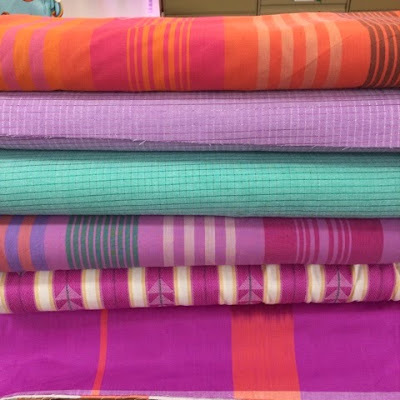 Linking up with Adrianne at On the Windy Side - be sure to check out everyone who does and cheer them on. 9. Glampstitchaswap bag. Don't worry partner, I'll be taking it with me fully finished to deliver in person next month but haven't committed to the fabric/pattern quite yet. 10. 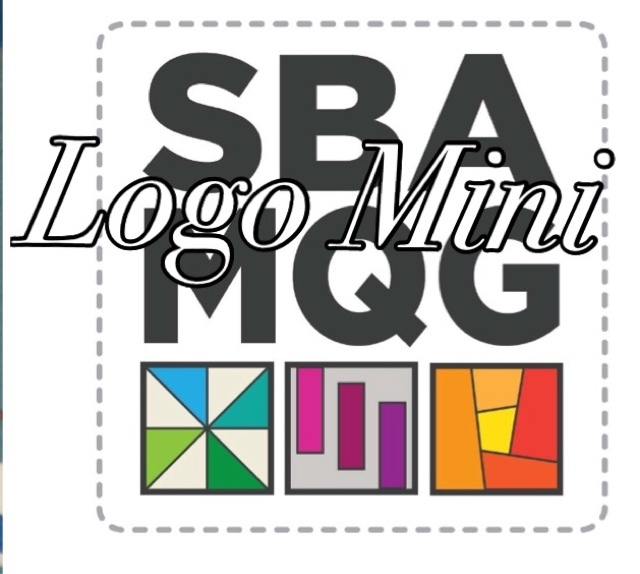 SBA MQG Logo Challenge. Mini due at the November guild meeting. "High contrast and graphic areas of solid color" is my charge. I'm thinking of bringing a QDAD to life. 11. Pillow Talk IG Edition. My partner has a very specific thing in mind and if I share it will spoil the surprise but let's just say that I'm super excited and nervous about who it is for. 12. Baby Boy Quilt for a special little one. 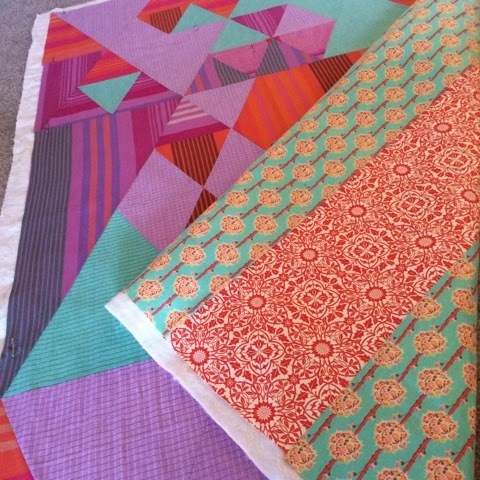 Thrilled to have the need for another baby quilt in our lives for a dear couple who will be amazing parents.